There's an old joke in the sport of dogs about a man who was thinking of sending his Border Collie to a well-respected handler for some training. The punch line being, of course, that the man should leave the dog at home and go himself. Ironically, therein lies more truth than was intended. Border Collies have been bred for hundreds of years with a single goal in mind: improved herding ability. Because of this, they are high-drive, high-energy dogs that move faster than the speed of gossip. Unmatched in brains, instinct, and endurance, they can do just about anything-and do it superbly. Someone once said they are so smart they can pick your pockets clean and leave you smiling about it. Picking pockets may be a good side gig, but their day job is "premier sheepdog." They are the working stiffs of the herding world, and they live it morning ‘til night. Sheepdogs have been around in some form or fashion for thousands of years. Much of what is known about their origin and early history is based on nineteenth-century literary tales, a bit of archeological evidence, and a good deal of speculation. Biblical references, such as Job 30:1, refer to dogs with flocks. Roman scholar Marcus Terentius Varro (116 B.C. - 27 B.C.) wrote about the care and training of shepherd dogs, and about a sheepdog he procured as a watchdog. Dr. John Caius's book Treatise on Englishe Dogges, written in 1570, is considered one of the earliest references to working sheepdogs in Britain. Interestingly, his description, written more than 400 years ago, bears an uncanny resemblance to the working style of today's Border Collies. The earliest sheepdogs, in all probability, descended from guard dogs similar to those that accompanied the Romans when they invaded Britain in A.D. 43. These dogs were most likely crossed-intentionally or unintentionally-with other dogs, including the herding Spitz-type dogs belonging to the Vikings who invaded Britain between the eighth and ninth centuries. What is known for certain is that the modern-day Border Collie is a product of the pastoral borderland between England and Scotland where shepherds needed a sturdy, trainable dog that would flaunt its natural herding and intellectual prowess while working long hours over rugged terrain. Of course, back then, most dog breeds were not clearly defined, and the Border Collie wasn't yet a Border Collie but simply a "collie" or sheepdog. These collies remained strictly working sheepdogs until the 1860s, when several events raised their profile and their popularity. Rumour has it that Queen Victoria first saw the rough-coated collies at Balmoral Castle in the Highlands of Scotland and took an instant liking to them, which quickly elevated them to royal status. Dog shows were also becoming fashionable, and it didn't take long for collies to find their way into the show ring. Shepherds in Britain supplied many of the early show collies, but they quickly realized they would be toying with disaster if they tried to breed a dual-purpose dog for both show points and working ability. This was a critical juncture for the Border Collie we know and love today. By the turn of the twentieth century, the separation between working collies and show collies was well under way. Shepherds continued breeding their collies with an emphasis on working ability rather than physical appearance, and the show collie eventually morphed into a breed of its own-the Rough Collie-and founded a dynasty of glamorous canine movie stars who portrayed the ever-popular Lassie. The Border Collie, on the other hand, continued in its "character" role as the tough, hard-working kid with rangy good looks. The advent of sheepdog trials in 1873, perhaps more than any other event, helped to establish the modern Border Collie's heritage through selective breeding programs that favored the quality of "eye" and the overriding importance of working style, ability, and durability. Today's Border Collies remain relatively unchanged from the dogs of the 1800s and early 1900s and, like the shepherds of old, today's working Border Collie owners prize herding instinct. They oppose any organization or written description that emphasizes physical appearance over working ability. In 1994, the American Kennel Club (AKC) accepted the breed for show-ring competition despite heated debate among breed aficionados. It was a feud that rivaled the Hatfields and McCoys, and it still continues to this day. Owners of working Border Collies fought tooth and nail against AKC recognition, fearing that once the breed began to appear in the show ring, its herding ability would no longer be a primary focus, and Border Collies would become pets and companions rather than superior workmates. For these reasons, Canadian owners opposed kennel club recognition in that country and succeeded in blocking it. One result of the traditional emphasis on working ability rather than physical appearance is that Border Collies come in a remarkable variety of colours and markings. They can be solid, bi-or tri-colored, red or blue merle, and even brindle-all with varying amounts of white. The colour pattern most commonly associated with the Border Collie is black with a white blaze, white collar, feet, chest, and tail tip. The coat can be smooth or rough, or anything in between. Although the AKC standard states that the height at the withers varies from 19 to 22 inches for males, and from 18 to 21 inches for females, working Border Collie owners would never favour a particular height over herding ability, and, indeed, the standard reads: "Overall balance between height, length, weight and bone is crucial and is more important than any absolute measurement." Contemporary show dogs tend to be shorter in leg with heavier, well-manicured coats. Working dogs have a rangier look with a more moderate coat. The AKC breed standard also describes a dog with extraordinary instinct, an uncanny ability to reason, endless endurance, trainability, and extreme intelligence. Unfortunately, these qualities that make them superior working dogs are the very qualities that can make them unsuitable as pets. They are workaholic dogs with type-A personalities and get-it-done-right-now attitudes. Napping is a waste of time for any self-respecting sheepdog. Louis Irigaray, a shepherd for 30 years and author of the book A Shepherd Watches, A Shepherd Sings, writes: "The dogs are workers, employees paid with an evening meal and a pat on the head...If the sheep are to be dipped in a hole in the ground, bathed in the chemical creosol to kill lice and ticks, five thousand of them headed for a hated swim, canine power sends them out of the corrals and into the tanks. There are no union problems and no other workers on earth are as anxious to get on with the job at hand." In the absence of adequate physical and mental stimulation, Border Collies quickly become bored and destructive. They can be obsessive, and their obsessions take many forms. They are famous for attacking moving objects, including lawnmowers, weed-whackers, and vacuum cleaners. Rakes, brooms, and snow shovels are equally stimulating to them. Others have been known to attack wheelbarrow tires, puncturing them with a single bite. Most Border Collies are passionate about tennis balls and toys, and they will gleefully shake cherished rugs, pillows, and carelessly discarded garments into oblivion. These intelligent, complex creatures are also known to develop compulsive behaviours. Some become mesmerized by reflective surfaces, such as mirrors, glass, or the stainless steel on refrigerators and dishwashers. Others go berserk at the sight of a fly. Some snap at the rain. Others spin in endless circles and almost all of them have a propensity to herd small children by biting and nipping at their ankles. Overview: Should you have a Border Collie as a pet? 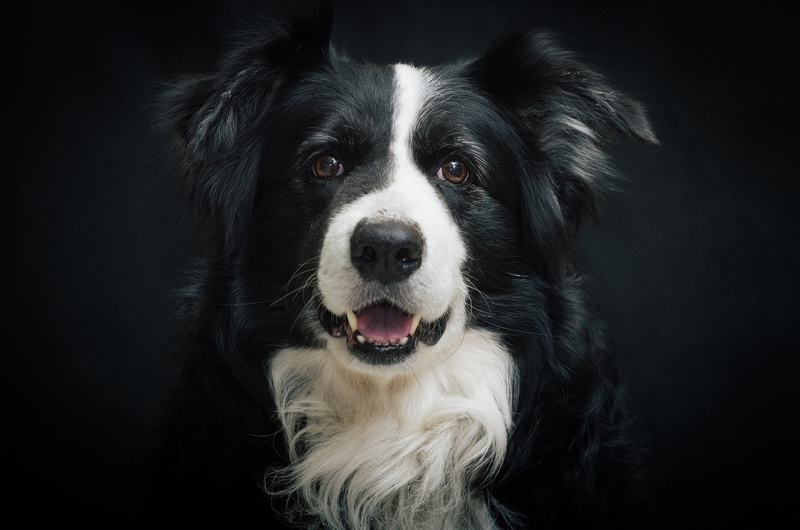 A Border Collie will always win your heart, but prospective owners must carefully consider their own lifestyle before committing to a 12- to 15-year relationship. While these dogs are a wellspring of affection and comfort, there are important physical and mental requirements associated with owning one. Border Collies are happiest when they are working. Few, if any, ever detox from their state of constant motion. It's not good enough for owners to merely think they have the upper hand-they must remain two steps ahead at all times. Border Collies are a good choice for farmers, ranchers, country dwellers, and marathon runners who understand the importance of including their four-legged friend in their day-to-day activity, whether that be herding, farm chores, jogging, hiking, swimming, or riding shotgun in the family car. Despite their propensity for obsessive-compulsive behaviours, calamity, and trouble of all degrees, life would be a much more boring without Border Collies. @Jessie Lacey: your post made me tear up. I just lost my 11.5 year old border collie, Sasha -- such a wonderful dog! and yes I thought she was a "barbie border collie". Didn't "eye stalk" and had more of a chocolate gumdrop eye than the lighter "crazy" border collie eye. Loved cats and children, a very calm temperament. But still -- a BC who loved to play and could catch anything on the fly! Loved to run and run and run -- and had a lifelong feud with the vacuum cleaner, her arch enemy. (Lots of bitten up hoses prove this.) Like your dog, Sasha was very slender and on the small size -- maybe the run of her litter? she was a rescue from the local dog catcher, so zero history, only that she was picked up on the streets as a runaway (no surprise there; she was a RUNNER!) and she was 9 mos to 1 year at that time. Many people adored her, she was so easy and such a sweetheart, but I did warn them that she was not truly the "typical" border collie. Though classically colored, with a B&W bandit mask, she may have had some non-BC in her that quieted down the usual high energy and stalking/herding behaviors. Just the perfect dog though. We are just heartbroken at her loss, in part because we KNOW we can't just drive on down to the border collie breeder and order up a puppy version of her.....she was unique and very, very special. Like you, we lived in the suburbs and a small house and unfenced yard -- we just walked her a lot! she loved her walks and knew everyone in the neighborhood! Just sitting here, looking at stuff about BCs and missing my little girl so very much....I was so blessed to have her for 11 years. Dear Anonymous: As we're coming up on the first anniversary of the loss of your Border Collie Sasha, I wanted to extend my sympathies on your pet's death. I'm the proud mom of a Border Collie named Sheena the Wonder Dog. She is a "pound puppy" but a BC breeder has assured us she's mostly BC -- and she sure behaves like it. She has become our darling companion and herds the family all around the house. That's why I'm sure that you miss Sasha as much as I will miss Sheena when her time comes. The best of luck to you! As the name suggests, vmate App is a downloader applying. regardless, it has a considerable measure of parts making it completely different from rest. the applying has lots of dimensions to uncover difficulties designed remarkably. a vmate approach can be described solitary handle for assorted of your online details. you'll have a great time from the Bollywood, showmanship together with movie, motion pictures and therefore songs. through vmate needed for android mobile phone, You will access [url=http://www.vmate.com/]vmate[/url] countless audio and simply the latest viral video. furthermore,possibly even, you will certainly no ask for downloads available during countless for the video media exploding pages. Authoritatively, [url=http://www.vmate.com/]vmate[/url] vmate Downloader just isn't available to buy on google have fun with playing preserve. nevertheless, patients who've got android phones used to merely considering rendition 2.2 in excess is likely to right now download the car. in addition, you'll save the most recent music as well as hd recordings with the help of the vmate application form. apart from that, You can begin to play active tv for pc to your android mobile phone mobile phones. this vmate downloader offers you quite a lot of showcases. on these individuals accounts, You will become more knowledgeable about the capabilities from this exceptional job in addition to the thusly utilize them to save the use of your internet numbers price tag. an incredible mark for vmate as operating system phones is by using this utilization, you could get the limitless find out. this key fact job application will allow you to Watch in addition take heed to all most current hi-d window films, Songs or maybe you correspondingly get a hold of these phones your appliance. outstanding element of the approval is always receive lots of pictures who has approximately 200 get to live television stations free of charge. vmate happens to be, the actual, an all in one instance. approximately 50,000+ light-weight businesses recommend and spotted this practical application while having good assistance your vmate. this bunch including 1000+ spectacular recordings, film, in addition to the tracks. Cricket blowers would now manage watch this particular cricket with a good fine quality from this form submission. the actual internet from ability merely ignored your ultimate a large number of admired movies well then simply interesting function to gather curious just what you had the site, put in specific vmate tool and watch each day soap the moment and including someplace. 1. It assists in the fastener your private videos. 2. Comes with an alternative to enable/disable move concerning portable multi-level. 8. outside web browser encouragement. Not all border collies herd children - my rescue BC is a perfect gentleman around them and seems to prefer children to adults. He doesn't see humans - no matter the size - as an appropriate herding target. I'm not sure if this was trained while young or a product of breeding for working ability rather than looks (he was an adult when I rescued him). The herding instinct in the show dogs is diluted to the point that the dogs dont really know what they should be doing - most dont know what to do with a sheep - but they still have a drive to do SOMETHING so they get in trouble picking the wrong 'jobs'. My dog has strong working instincts but only for 4 legged animals - he ignores birds (including chickens, geese, ducks etc) and humans. Interestingly, if he sees a human At a distance on all fours he tenses and starts to crouch but the moment they stand up or he gets close enough to see its human he loses interest. Unfortunately he thinks dogs are appropriate to herd so he can't be offlead around them or the crouching and stalking starts fights. I live in an apartment with my dog and I work full time and he's never destroyed anything or barked while I'm out. I do take him for long hikes at the weekends though, and 5-6 longish walks per day during the week. He has also decided that it's his job to oversee anything that I do and he does actually help me with cooking by coming to get me when he smells that the food is done or is starting to burn. He also comes to get me if there is someone at the door and I haven't heard it, and he alerts me to anything unusual or dangerous going on in the house. Once a kitchen unit had partially collapsed and he whined and jumped at me until I followed him to see the countertop tilted and things starting to slide off. I managed to save the breakable items only because he'd alerted me in time. I had seen some working border collies and was inspired by them, but by the same token they were kenneled for the night because they would get into mischief. We needed a replacement dog and I wanted a collie but one that worked and lived with balance. We got our first one as we also had cattle, and it changed our lives. We were awed by its love, affection, and smarts-- I always tell people they are dogs with hard drives in their head. After this one, we got a Border collie/Golden Retreiver Cross- we had livestock, but we also wanted a dog suitable for seniors and children as well. This turned out to be a perfect cross, and one of the best dogs we ever had. She hated cattle and has numerous times redirected a mother cow's protective fury aimed at my brother and same him from injury countless times. She didn't want cattle close to use, for fear that they would hurt us. She has twice come to my aging mother's rescue when she fell outside and ran to get assistance. If you have a flu bug she would check you every hour, lick down the fever until you were well. Buddie is 5 years old now and brings her love to residence of a senior home. The Border/golden cross is a terrific cross as it gives you the best of both, down blends the purebred health issues, and minimizes the obsessive behaviours or issues of both breeds. I live in an apartment with an 8 month old border collie. Having her in my life was the best choice I made. She's so wonderful! I don't agree that they are just for those who live in the country, as long as you have a park around where they can run free (preferably after a frisbee) then they should be fine. The key with borders, whether you live in the city or in the country, is to have time for them. I wouldn't recommend them to those who do not work from home, or who are single. They require a lot of attention. Of course they need activity but I find that a lot of other larger dogs need that as well. It's important to invest time training them so they know what to chew on, where to go and how to behave. My border is the most loving, sweet, fun dog I have ever had. She makes us laugh all the time. Well i have a 18 month old BC,Tess, from working stock, i couldn't have gotten a better companion, She is loyal and always there, Since day 1 i have spent hours woth her, working on obedience for the KC Good Citizenship award, we are now sitting our Gold. She is loving the Agility Training, next year she will compete and i rekon she'l compete to a high level - tho this is my first time at agility, so it is now and again me keeping her back. She is great with all animals, and people alike, adores kids, and doesn't round them up, if you are willing to give her a simple pet she will be your friend for life. She is going to be put through as a pets at therapy dog, to help and comfort those in retirement homes, hospitals etc where they don't have there own pets. She has endless energy, you cannot tire out a BC,it is impossible to tire the body out, so Trick training is what we do, after 20 mins of trick training she is happy for a sleep. She used to be scared of swimming as a pup but now i can't get her out of the water, she swims as well as an otter, dives of the banks into fetch a stick. You can see that there is more than the average intelligence behind those eyes, thos eyes that stare straight into you, for me it is like speaking to a fellow human, she knows what you're talking about and is happy to listen. She helps me with daily house work, unlike some collies she has no obsession with the hoover, mop, brush, she picks washing up and puts in the basket, any rubbish she picks up and puts in the bin, she takes the mail from the front door and hands it to me, it is endless the things she does and to think she is only 18 month old. You can see the natural Collie abilities in her, as we head down the field to my horses we pass sheep, she instinctively stalks and watches, but don't need a lead, She knows her job and what is expected, for sheep she will not chase, she stalks past them then when almost passed runs away down the field to meet the horses, the sheep stop and stare there all confused, the 13 collies the farmer has wouldnt think twice about getting them moving, but Tess no, she would rather wait in the grass, wait patiently, gain their trust, its friends she wants to be with them. If not given the stimulation they require yes distructive they can be, many people see Tess and think "that one will nip and snap" and are surprised when they get a belly to rub instead, for this is the true BC one who loves unconditionally, who will work there hardest for as long as is required of them, It is only lack of training, socialisation and leadership that these fine intelligent breeds are given a bad name. You never need to give them a hard hand, a glance is all they need, they know how you are feeling, and pick up on it before you say. The one thing that must be remembered is they are a sensitive breed, where one bad incident can be hard to over come, but over come they will as long as they are given the time and help required. This is the best breed of all breeds for me. Now i could have no other. The pure enjoyment, pleasure and laughs we have together are each a memory i will treasure.